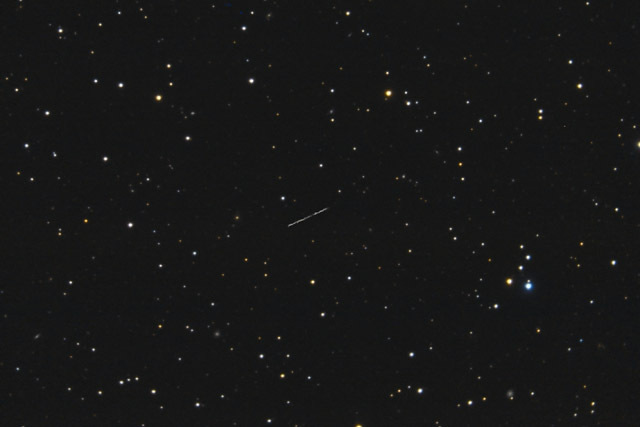 This image shows the track of the asteroid number 5630 that was named in honor of Bill Schaefer. Bill Schaefer was renowned in the 1950s through the early 1990s for the superb german equatorial mounts as well as numerous telescopes he built. His mounts were used by some of the top astrophotographers of the time, including such notables as Martin Germano and Tony Hallas. Many of Bill's mounts are still in use today, including my very own Schaefer mount. In 1983, I had been fighting stability problems while photographing with my Celestron C-8 which was mounted on the original Celestron wedge and fork mount. These problems limited my astrophotography with the C-8 to those nights when there was barely any breeze. On one particularly windy night in October, I was up on Mt. Pinos where the wind was blowing with gusts over 40 mph. The only thing I could do was to put a 35mm wide angle lens on my camera and piggyback it on the telescope. Meanwhile, Martin Germano was photographing with his C-8 at 2000mm focal length and guiding at 480 power! That was what convinced me that I needed to have a Schaefer mount like Martin's. Fortunate for me, Bill Schaefer must have taken pity upon me, as he agreed to build my mount. I anxiously awaited while he took about 2 1/2 months to build it in his machine shop - a converted single car parking stall at his condominium complex in Fullterton. I stopped by several times while he was building it, and I was astounded to see him pick up my 70+ pound equatorial head and move it from machine to machine. Consider that Bill was 80 years old at the time, and my mount was the smallest mount he made! When I took delivery of my mount in January 1984, it performed spectactularly and transformed my astrophotos. Today, the old mount is almost 30 years old, and it continues to be an extraordinary piece of equipment that is the most important component of my astrophotography. Moreover, it is still my most prized possession. Sadly, Bill passed away in 1993. For his many contributions to amateur astronomy, Bill posthumously received the honor of having the asteroid 1993 FZ named after him. I remember Bill as a very kind and generous man. I was 24 years old at the time Bill built my mount, and I've often wondered if Bill was willing to build my mount because he thought I was a young man who could continue carrying on the hobby of amateur astronomy. Whether that was in his thoughts or not, I enjoy doing just that, and I try my best to be like Bill - giving back to the amateur astronomy community in whatever way I can. With that notion in mind, I would like to dedicate this image to the memory of a wonderful man, Bill Schaefer. His contributions to amateur astronomy are legendary to many of us in Southern California, and he well deserved having this asteroid named after him. At a minimum, I believe I owed it to him to take a night to photograph his namesake. Rest in Peace, Bill Schaefer. Software Used Images Plus 5.0 for camera control, calibration, stacking, digital development, star shrinking, smoothing and noise reduction. Photoshop CS5 used for levels and curves, star shrinking, lab color, saturation adjustments, vibrance, and selective color. Gradient Xterminator for gradient removal. Carboni Tools for additional noise reduction, and smoothing. Registar for aligning composited layers. Notes On the night this image was taken, the asteroid was at magnitude 16.2. The asteroid was moving across the sky at a rate of approximately 1/4 of a degree per day. Due to this motion, the asteroid left a track across the image during the 4 1/2 hours I photographed it. Because the asteroid was in the galaxy rich constellation of Leo when I photographed it, the image contains a number of faint galaxies. Although they appear quite small, this image contains at least a half a dozen of these background galaxies. The original uncropped image contained twice as many. This astrophoto was rather challenging, in that I had no way of identifying the asteroid while I was photographing it. 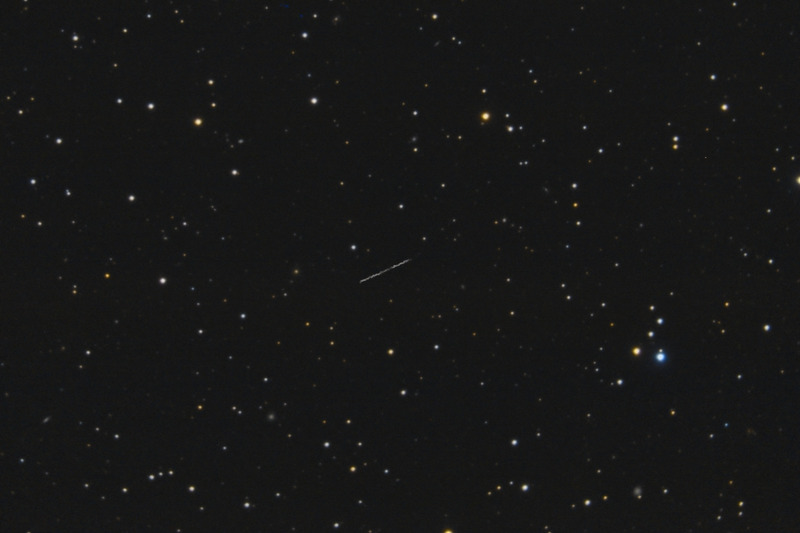 Fortunately, I chose an imaging night when the asteroid was only a degree away from the fairly bright star, 31 Leo. Since my mount doesn't have Goto capabilities and I rely upon the mount's original manual setting circles, I had to point the scope by using an offset from 31 Leo and then trying to identify the stars in the field. Gladly, the technique worked. The photographic challenge was frustrated even more by the fact that I had horrible seeing conditions that night (despite a forecast that called for excellent seeing!). In this image, North is Up. The image has been cropped to 66% of the original full frame.